These popular cruisers were sold as complete craft. The semi displacement hull together with long keel provides an easy handling river craft which is also capable of sea work. 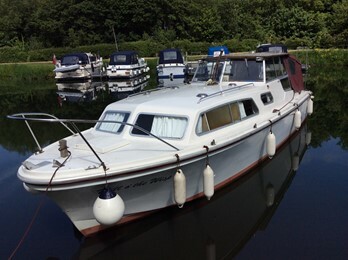 The large cockpit together with 5 cabin berths make this a very suitable, spacious family boat. RLM marine of Chertsey also built a version known as the RLM Bahama and Entice in aft cabin form. These featured high quality timber interiors, Engines varied enormously from petrol to diesel, usually on outdrives.